November is a time here in Northern Michigan where the weather is chilly and much attention is spent in the woods and on the gridiron. With light fishing pressure overall, there are still some wonderful opportunities for anglers, on many bodies of water. On the inland lakes, walleye fishing is excellent this time of the year, with many of the ‘eyes having moved onto the shallow flats and adjacent weed beds. Crankbaits can draw vicious strikes from hungry walleyes (and pike) that are lurking in the shallows. Similarly, bass will also be on the shallow flats, and blade baits and jerk baits can rule the day when the right cadence can be identified. Perch fishing is generally hot in November, as the big jumbos are gobbling minnows and wigglers in preparation of the colder winter months. Perch rigs tipped with minnows or wigglers, jigging spoons and even jigging Rapala style jigging baits all work at times, and should be in every perch angler’s arsenal. With shorter light periods during the day, feeding peaks are condensed together, and there can be a great bite when the weather cooperates. 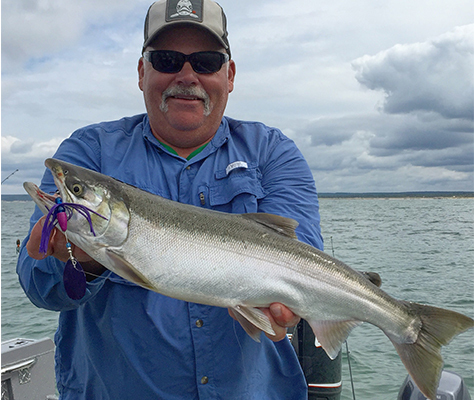 For anglers targeting the area’s tributary rivers, there are nice steelhead and lake- run brown trout options to consider. With a slow salmon season, during September, and the peak being in mid-October, things are late this year. But with some cold fronts and heavy winds, things seem to be a bit more back on track now that we are into November. Steelhead and brown trout will readily eat a variety of offerings, both on fly and traditional spinning gear. Both are opportunistic, and aggressive feeders. Salmon eggs, minnows and stoneflies are all on the menu. For fly anglers, streamers swung in the current or stripped in a quartering fashion against the current can lead to some awesome takes. The standard egg pattern can also be highly productive when fished under a float or bounced on the bottom with a chuck & duck rig, although this rig is less reminiscent of traditional fly fishing than it is of a spinning gear technique. Despite which side of the fence one is on this topic, it’s still a great option to pick up steelhead and trout holding near the bottom. For traditional gear anglers, beads and spawn bags are my favorites, and when fished under a float, there’s no doubt when a fish is interested. Small jigs tipped with a waxworm are also a very good option, especially when the steelhead seem to want a bit of meat. Fall can be a great time to be out on the water. With chilly weather and cold water temperatures, please take care to dress appropriately for the weather and be cautious when venturing out. Let other’s know where you will be fishing and when you plan on returning. With few other anglers around to come to your aid, it’s important to put safety first. Have fun, stay safe and catch lots of fish! Captain Ben Wolfe with Sport Fish Michigan gives his report for the Michigan area waters during the week of November 9-15, 2015.